Well, that is the fourth year of fieldwork and excavations at the High Pasture’s site at a close.....and what a year it has been. Once again, we have recovered an amazing amount of information relating to the use of the site during the Iron Age, have made some interesting finds and have been assisted by a great core of site volunteers - the amount of work completed this year would not have been possible without their help....thank you. Excavation of these deep and complex ash deposits, including unravelling their deposition within this part of the site, has been time-consuming but rewarding. 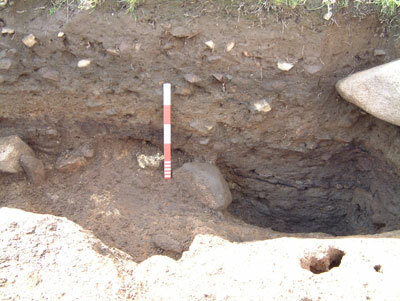 The re-deposited ash layers appear to be related to a sequence of hearth settings uncovered in this part of the site, during excavations in 2005 and this year. However, these layers are not haphazard dumps of material from the fires, scattered at will. What we appear to be uncovering are complex sequences of structured deposition of these materials - spread in a uniform and organised manner over this surface. 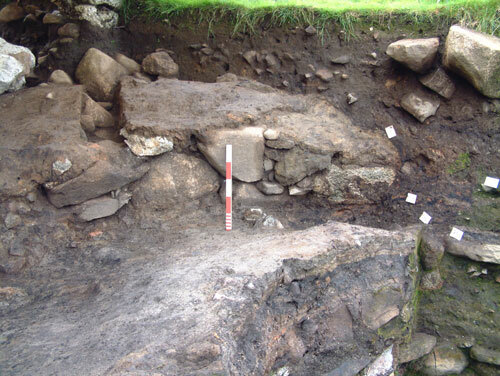 The layers of ash and associated materials uncovered in Trenches 15 and 2 have been contained by a series of stone walls and boulder settings. Some of these are quite ephemeral in nature, comprising single rows of boulders arcing around and respecting the stairwell entrance leading down into Bone Passage. The ash layers have been cut through by several features including a large fire-pit (see news update in September) and smaller pits, post-holes and stake-holes. These most likely form activity areas within this part of the site, which had sunsequently been buried by later deposits of ash and clay. The image above shows a close view of one of the surfaces uncovered in the ash deposits (scale = 0.1m). Burnt organic debris includes small branches of wood charcoal, burnt grain and hazelnut shell. 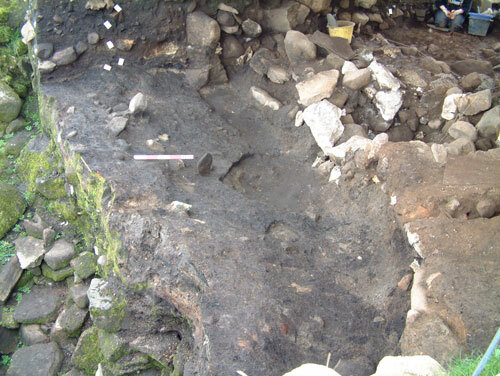 Post-excavation analysis of samples taken from these deposits should provide details on what types of material was being utilised for fuel in the fires, along with residues of plant materials and other types of deposit cooked in the fires. Thin-section analysis of these deposits will also provide data on the potential temperatures of the fires and whether these may relate to normal domestic fires, industrial processes, or the cremation of animal carcasses. Several deposits of cremated bone have been recovered from the ash layers during the 2007 excavations, which may relate to the cremation of animals in these fires. During the excavations in the ash layers towards the end of the fieldwork season, it became apparent that these deposits had initially been contained by a more substantial stone-built wall. The ash layers were found to sweep vertically up the face of the wall, the plasticity of the deposits allowing this, and at the NW end ride up over the top of the wall. This unusual sequence of deposits baffled us initially and called for some interesting excavation and recording techniques to be called into play. However, by the end of fieldwork in late September/early October, we had managed to uncover some of the face of the revetment-type wall. The image above shows the NW end of the wall disappearing into the baulk of Trench 15 (scale = 0.5m). The wall has been constructed from granite and limestone boulders, some of which have been affected by heat and are crumbling away! The boulders are faced on the NE side of the wall and so it would appear that this is the face that would have been open to view when first constructed. Pinning stones can be seen filling gaps between boulders, so some care has been taken in it’s construction and appearance. However, the face of the wall is leaning at an alarming angle and appears in a state of near-collapse (see image below). Therefore, we decided to leave some of the capping materials over the wall in place for the winter, while we also made the decision to refrain from removing any additional ash deposits from the NE side of the feature. This should help to hold the structure of the wall in place until next year, when we can start recording and excavating the feature in optimum conditions. 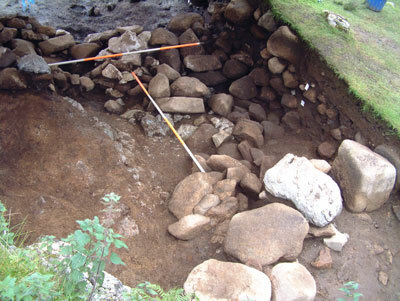 We still have at least 1.5 to 1.8 metres depth of archaeological deposits to remove from the NE side of the wall in 2008, which should also allow us to finally get to the bottom of the deposits running below the stairwell into the cave beyond. Therefore, it is difficult at the moment to determine how high the wall stands, although it appears that we are nearing the base of the archaeological deposits on the SW side of the wall. 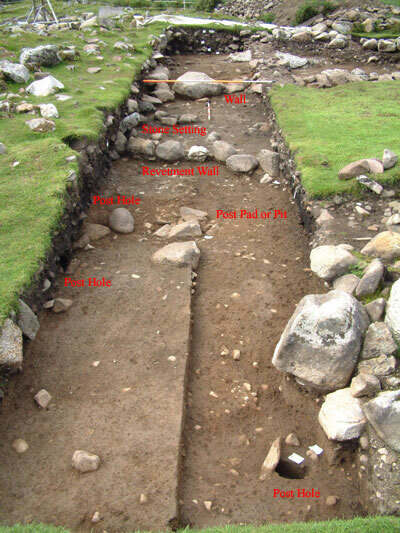 The image above shows the SW side (back) of the revetment wall F15.11 (scales = 2m). We have removed a significant amount of material on this side of trench 15 including complex deposits of fire-cracked stone, ash and charcoal, into which have been constructed ephemeral cellular structures. Below the structures we uncovered a chaotic mix of boulders, fire-cracked stone and sediments, that appear to have been deposited in a natural gully leading towards the entrance to the cave. Towards the base these boulders have been packed into place, forming backing to the wall feature shown above. Some of the material backing the wall appears to have toppled forward, with the wall, indicating that major subsidence has occurred somewhere below the wall. We should be able to unravel this sequence of events more thoroughly in 2008. The line of boulders in the foreground of the image above is feature F15.08, one of two revetment walls arcing around the cavers entrance into High Pasture Cave. Small finds were few and far between on the SW side of the revetment wall F15.11, but we did recover more items on the NE side within the ash lenses. Therefore, it is possible that the more substantial wall uncovered in Trench 15 (F15.11) may be an earlier attempt to contain the ash deposits and activity areas immediately outside the stairwell and cave entrance into Bone Passage. Later in the life of the site, revetment walls F15.08 (see above) and F15.02, may have been constructed to provide additional protection to the deep hollow outside the stairwell entrance from flooding. Even today, during periods of very wet weather, the cave sinks (including the cavers entrance) cannot take all of the freshwater run-off from the surrounding catchment area. During such flooding events, the water overflows from the main cave sink and gathers in a deep pool adjacent to the cavers entrance and revetment wall F15.02. At a time before these revetment walls had been built, and the deep archaeological deposits surrounding them had accumulated, water would have been able to run freely into the cave entrance into Bone Passage, also flooding the deep natural depression outside the entrance where many of the activities at the site were taking place during the Early Iron Age. Therefore, this series of structures may form a type of anti-flooding defence system - low dams to obstruct the flow of water into the abandoned fossil passage (Bone Passage). Of course, once the stairwell had been constructed to full height, then this would have stopped the flooding of Bone Passage. However, only with the construction of the revetment walls would the area immediately outside the stairwell entrance have been protected from these flooding events. 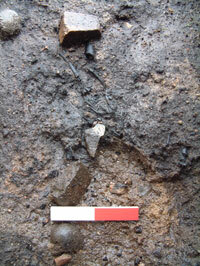 During 2008, we will excavate more of these features so we can fully interpret their function at this unusual site. Elsewhere on site, we have continued our investigation of anomalies identified through the geophysical surveys in 2004 and 2006, including the extensive burnt mound deposits. This major feature of the site arcs around the stairwell / cave entrance to Bone Passage, but also extends a considerable distance to the south of this feature. The deposits of fire-cracked pebbles and stone, ash and charcoal vary in depth from around 0.25 metres up to 0.75 metres. We have also uncovered revetment walls, post and stake-holes, and pit features associated with these deposits - some of which pre-date the formation of the burnt mound, while others are contemporary. During the last news update in September, I covered in particular the work within Trench 14 - a trench initially excavated to investigate the two shieling structures in this part of the site. Below the shielings we uncovered extensive burnt mound deposits, which also contained pottery, crucible fragments, a rough-out for a shale bracelet and an interesting iron concretion. By September, we thought that we had reached the natural karstic clay, covering most of the surface of the trench. However, on further investigation we found that some of this clay was re-deposited material that covered a lower and potentially earlier burnt mound deposit. The image above shows a section cut through the lower burnt mound deposit, which is quite shallow here, with the re-deposited clay capping this. 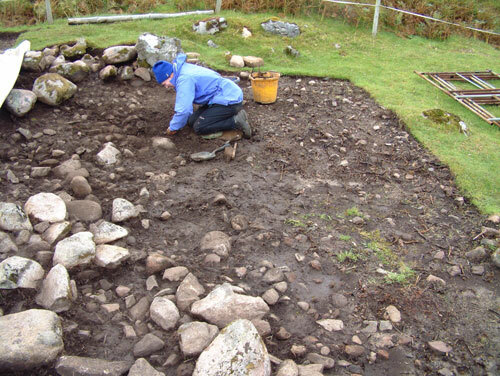 Further excavation revealed part of a quite large hearth setting comprising fire-cracked pebbles surrounded by a setting of un-burnt larger granite stones. 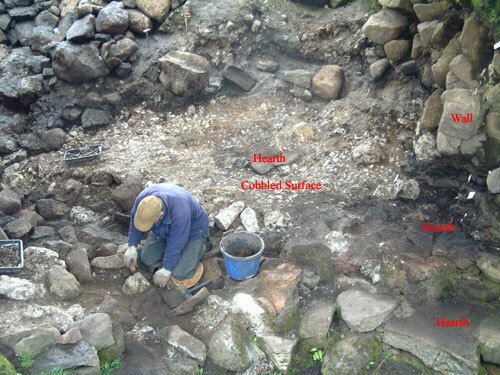 The image below shows George Kozikowski excavating to the W of the hearth, where he is starting to uncover a sharp dip in the natural clay ground surface. The excavation here uncovered a complex sequence of fine alternating layers of ash, charcoal and silty sediments, creating a rather deep section of trench. 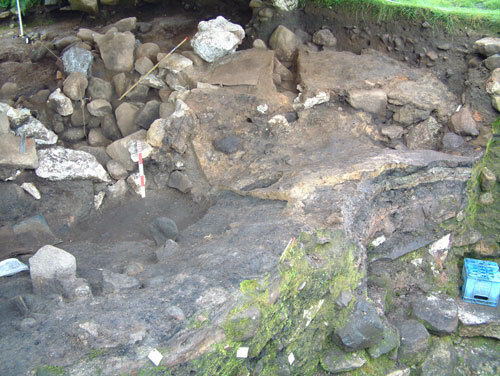 Excavation of this feature will continue in 2008, when we will extend the trench to uncover these features in full. 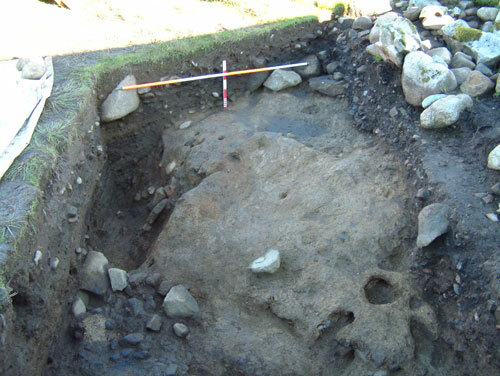 The pit-like feature would have been located in an ideal part of the site to hold water, lying in a deep hollow to the NE of the cave sink, and combined with the hearth setting may have played a role in the formation of the burnt mound/spreads. We know that water accumulates in this hollow during episodes of flooding at the site, and it is this flooding that may have played an active role in the formation of the silts, charcoal and ash layers identified in the deeper part of the trench. The archaeological deposits uncovered in Trench 14 vary considerably with those identified in Trench 15, which is located just a few metres to the NW. 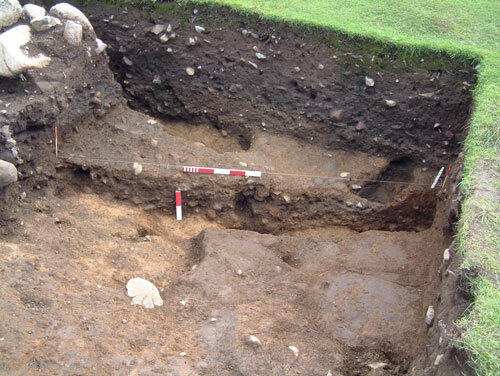 Therefore, excavations in 2008 will investigate these relationships more fully, so we can make informed interpretations regarding deposition and function within this part of the High Pasture’s site. Elsewhere on site, we have excavated several 1m square test-pits to investigate geophysical anomalies, which have produced varying results, while in the cave Trench 17 has been excavated down to the natural bedrock floor. Small finds in Trench 17 have been few this year (when compared to work in Bone Passage between 2004 and 2006), while we have also seen a marked reduction in well-preserved faunal remains. It appears that the area beyond the natural narrowing in Bone Passage has not been utilised for the deposition of material as seen in the chamber area at the base of the stairwell. The excavations in Trench 17 identified the tail-end of the ‘rich’ archaeological deposits, comprising well-preserved animal bone, large pieces of red deer antler and pottery, lensing out towards the narrow section of the passage. Within the narrow section of passage we did uncover the last section of paved floor, as previously identified in Trenches 1 and 6, and between two of the paving slabs we did find a fine socketed iron axe. However, once we porgressed beyond (to the N) of the narrows, the deposits changed dramatically. Here, we uncovered some compacted layers of fire-cracked stone (possible continuation of floor) with associated fragments of animal bone, charcoal and shellfish. Below this, we uncovered a more chaotic mix of granite and limestone boulders, black water-worn cobbles of granite, and gritty water-washed sediments. 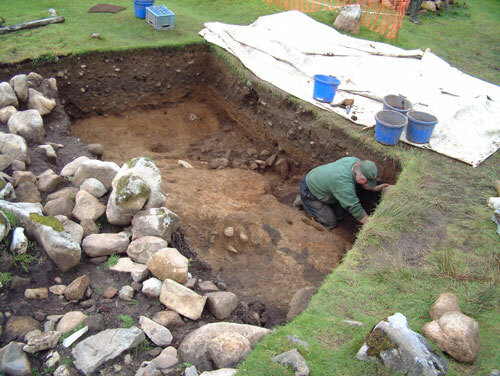 During the 2008 fieldwork season we will remove the last of the archaeological deposits from Bone Passage (adjacent to the ramp leading down into the active stream passage) and will finish our recording of all features. The latter will hopefully include a laser-scanning survey of the stairwell, Bone Passage and some of the natural cave beyond, in order to produce an accurate 3-D representation of this important part of the site - something that would be impossible to achieve using more conventional survey techniques.